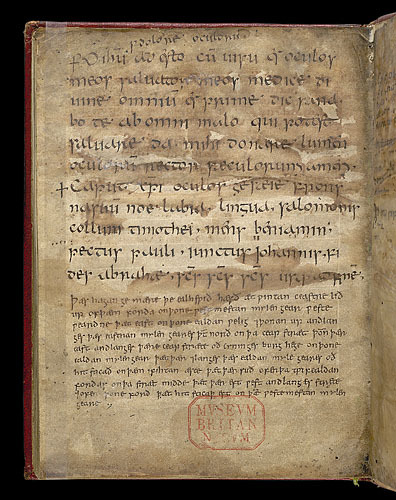 Description: Text page in a section of the manuscript which contains prayers of Irish origin, including an incantation against weak eyesight: '...give light of the eyes to me.' Near its end, it calls upon the body parts and qualities of saints and Old Testament figures ('the tongue of Solomon, neck of Timothy, mind of Benjamin ...') and ends with the 'Sanctus, Sanctus, Sanctus.' Below it is a late 9th- or early 10th-century inscription in Old English concerning the gift of property by its founder, Ealhswith.